As we age the eyes can begin to look tired due to excess fatty tissue, dropping eyelids, puffy eyes and loose skin. Eye bag removal surgery can help to rejuvenate the face by providing a fresher, younger looking appearance. What is Eye Bag Removal Surgery? The medical term for eye bag removal surgery is blepharoplasty. This cosmetic treatment involves surgery on either the lower or upper eyelids, or both if required. As the eyes play a great part in appearance this is one of the most popular cosmetic treatments for both men and women. Fat and excess muscle can be removed and the eyelids can be tightened to give a smoother, firmer appearance. Blepharoplasty can be a stand along procedure or can be undertaken at the same time as other cosmetic treatments. What is Involved in Eye Bag Removal Surgery? Eye bag removal is an invasive surgical procedure; this means that incisions will be needed during the surgery. But non-invasive blepharoplasty treatments are available with the use of lasers. Lasers can be used to reduce fat in the specified area and will help to tighten the skin around the eyes. Deep penetration using a laser can be used to eliminate dark circles and induce collagen, which will improve the eye area appearance. Invasive blepharoplasty will involve cutting the skin and removing excess fat and removing skin to tighten the area around the eyes. Physically fit men and women over the age of 35 are the ideal candidates for eye bag removal. Smoking can be one of the major factors to puffy and sagging skin under the eye. It may be that eye bags, drooping eyelids and puffy eyes are a hereditary problem and if this is the case this can be treated at an early age. A cosmetic surgeon will be able to assess individual cases and outline the treatment and any alternatives. Patients should be realistic in their expectations; blepharoplasty can give a fresher look but will not eliminate problems such as crows feet around the eyes. Most blepharoplasty procedures can be completed in around two to three hours. A general anaesthetic will be used during the surgery and an overnight stay in the clinic will usually be required. Recovery time does take around 10 days but this will vary between patients. 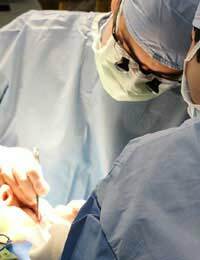 Most people are able to go back to work as little as a week to 10 days after the procedure. Strenuous activity should be avoided for at least three weeks to avoid any strain on the treated area. Some scarring is to be expected after blepharoplasty. Swelling and bruising may also be noticeable during the recovery period. Swelling and bruising should disappear after the 10 day healing period. The eyes may feel dry during this time and eye drops can be used to lubricate them. Sutures will usually be removed after five days. Any scarring will disappear during the healing period and should not be noticeable although healing does differ from patient to patient. There are many different names used for eye bag removal surgery or blepharoplasty. This is worth remembering when researching this type of treatment and the surgery is sometimes known as eyelid lifts. Prices for eye bag removal in the UK will vary from between £1500 to £2000 for surgery to the upper lid. Both upper and lower eyelid surgery will usually cost around £3000 to £4500 in the UK. Going abroad for this type of cosmetic surgery can dramatically decrease the cost by as much as 50% to 70%. Eye bag removal and eyelid cosmetic surgery is fairly free from side effects. Swelling and bruising are the most common effects of this type of surgery. Some patients may suffer from blurry vision during the healing period and some pain is to be expected although this is a minimally invasive type of surgery. Patients who do suffer from pain or blurry vision after the healing period should consult their cosmetic surgeon for advice and treatment. Post operative care for blepharoplasy is minimal and a UK doctor will be able to give advice if the surgery was conducted abroad.